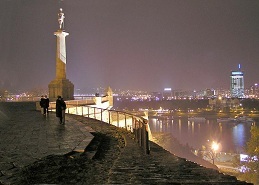 Belgrade is the capital and largest city of Serbia. The city is located at the confluence of the Sava and Danube rivers, where the Pannonian Plain meets the Balkans. Its name in English translates to White city. The city proper has a population of over 1.1 million, while its metropolitan area has over 1.6 million people, making it one of the largest cities in Southeast Europe. 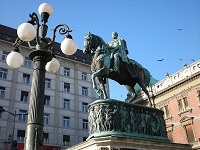 The historic areas and buildings of Belgrade are among the city's premier attractions. They include Skadarlija, the National Museum and adjacent National Theatre, Zemun, Nikola Pašić Square, Terazije, Students' Square, the Kalemegdan Fortress, Knez Mihailova Street, the Parliament, the Church of Saint Sava, and the Old Palace. On top of this, there are many parks, monuments, museums, cafés, restaurants and shops on both sides of the river. The hilltop Avala Monument and Avala Tower offer views over the city. Josip Broz Tito's mausoleum, called Kuća Cveća (The House of Flowers), and the nearby Topčider and Košutnjak parks are also popular, especially among visitors from the former Yugoslavia. Powered by Instant Sajt, (C) 2019.